The Mountain Hermitage is pleased to offer a 5-week Vipassana retreat taught by Sayadaw Vivekananda and Marcia Rose in Summer 2019 at the Columbine Inn in beautiful Taos Ski Valley. This retreat will follow a specific format based on the Mahasi approach to Vipassana practice, with The Progress of Insight as its basis. We invite experienced practitioners to join us for the full five weeks. A scholarship fund has been established to offer financial aid to those who would otherwise not be able to attend and to promote diversity. There is no fee required of monastics who would like to attend this retreat (spaces are limited). Applications and deposits are requested by May 2, 2019. Late applications will be considered on a space available basis. As taught in the tradition of the late Venerable Mahasi Sayadaw of Myanmar, Vipassana meditation consists of continuous mindfulness in sitting and walking meditation, and in all general activities. 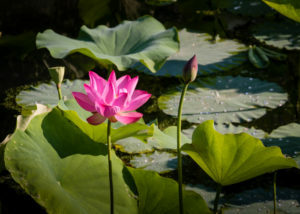 During sitting meditation one’s awareness is directed to the most prominent physical or mental object of observation, beginning with the rising and falling movement of the abdomen. Slowing down bodily movements throughout on e’s daily activities and restraining the senses are essential aspects of the practice. Meditators are supported and guided in their practice through regular interviews and Dhamma discourses. All meditators are required to observe the ‘Eight training precepts’; and to maintain ‘Noble silence’ throughout the course of the retreat. Through an unbroken and continuous observation of distinct physical and mental objects arising in one’s meditation, a meditator will come to understand the three universal characteristics of all phenomena; that they are impermanent, unsatisfactory, and void of an abiding self. The ultimate aim and primary benefit of this Vipassana practice is the attainment of path knowledge and fruition knowledge, which take ‘Nibbana’, the State of Peace, as an object. The mind has a tendency to be dominated by various unwholesome mental states such as greed, anger, fear, ignorance, pride, wrong views, doubts, laziness, restlessness, and worry, to name just a few. 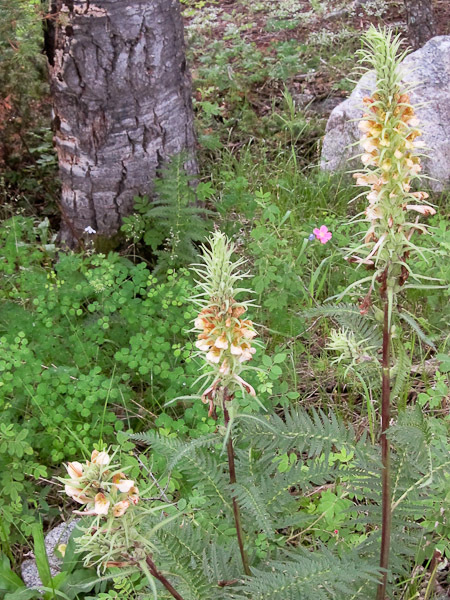 These can be seen as the causes for suffering, both in us and in all beings. Through careful observation these unwholesome mental states will subside, allowing wholesome mental states to arise in their place. Mental states such as effort, mindfulness, concentration, intuitive wisdom, joy, tranquility, peace, happiness, loving kindness, compassion, empathy, equanimity, contentment, and patience reduce suffering and increase a person’s mental and physical well-being. This is known as the purification of the mind, which is another major benefit of Vipassana meditation. You must have sat three or more 7-10 day retreats or a retreat of one month or longer. These retreats must have been led by a recognized teacher. Details of the qualifying retreats, including teachers’ names, dates, location and length of the retreat, must be documented on the application form. Preference will be given to those who have practiced in the Mahasi style as described above. Venerable Vivekananda has trained under the Venerable Sayadaw U Panditabhivamsa of Myanmar since 1988. 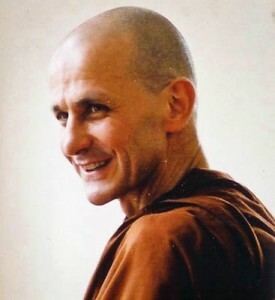 He is the resident teacher and abbot at Panditarama Lumbini International Vipassana Meditation Center, Lumbini, Nepal. He has been teaching Vipassana meditation and Brahma Vihara meditation in the tradition of the Venerable Mahasi Sayadaw since 1998 in Lumbini, Nepal, the United States, Europe, and Israel. Venerable Vivekananda guides meditators in a precise and encouraging manner. 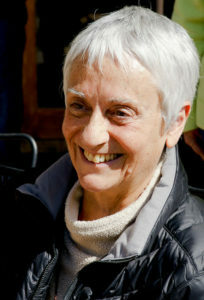 Marcia Rose lives in Taos, NM. She is the founding and guiding teacher of The Mountain Hermitage. She has been studying and practicing Buddhist teachings and meditation with Asian and Western teachers since 1970, primarily in the Theravada-Vipassana (Path of the Elders) tradition. 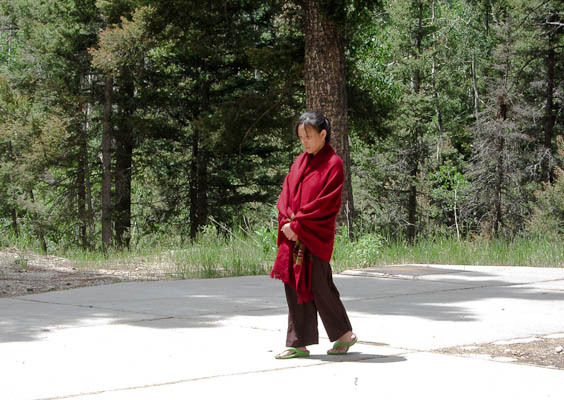 Her own teaching reflects a clear influence from the Burmese Mahasi Vipassana and Pa-Auk Forest Monastery lineages. Marcia was resident teacher for staff at the Insight Meditation Society (IMS) in Barre, MA from 1991-1995. She continues teaching at IMS as an occasional visiting teacher and is also a regular visiting teacher at The Forest Refuge in Barre, MA. Marcia also teaches Vipassana, Brahma Vihara and Concentration retreats in other U.S. and international venues, and is dedicated to offering these ancient and timeless teachings in ways that make them accessible and authentic for contemporary culture. 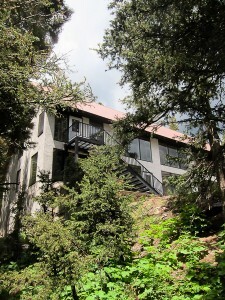 The Columbine Inn, in Taos Ski Valley, is a comfortable timber- frame lodge situated among tall pines at 9200 feet elevation in northern New Mexico’s beautiful Sangre de Cristo mountains. The Mountain Hermitage will have exclusive use of the Columbine Inn during the period of this five-week retreat, enabling us to provide the privacy, quiet, and sense of harmony most conducive to intensive practice. There is a lovely meditation hall, indoor and outdoor walking areas, and a large dining hall. All of the rooms at the Columbine Inn include a private toilet and shower. Many of the rooms are spacious enough to allow for sitting and walking meditation for those wishing to practice in a more secluded setting. Information about transportation and what to bring will be sent to those accepted into the retreat in time for making travel arrangements and packing. Fees are on a sliding scale to allow you to pay according to your means. Our actual cost for the month per retreatant is $3155. A portion of our scholarship fund is being allocated for this retreat to allow us to continue to offer the low range on the sliding scale. Please pay as much as you are able to allow others to attend who need to pay less. Any amount above $3155 will be gratefully received and treated as a tax-deductible donation. The first eight people paying at benefactor rate will be assured of a single room with private bath. Other applicants may possibly be assigned to share a loft-style room (one bed on each level) with another yogi, which still offers considerable privacy and includes a toilet and bath shared between the two occupants. We have a large deposit due early for this particular retreat site, and thus need to ask each person to send a retreat deposit of $1000 with his/her application. The balance can be paid on arrival at the retreat on June 2, 2019, though earlier payment if possible would greatly appreciated. Some additional scholarship funds are available. Please fill out the special scholarship application form and include this with your regular application form. The Mountain Hermitage will gratefully receive donations to our scholarship fund to enable those in financial need to attend this retreat. Donations are tax-deductible and should be marked ‘Scholarship Fund’. The retreat fees only cover basic expenses and operating costs. The teachers offers the Buddha Dhamma without any set fee, and totally depend on DANA – on the generosity of their students and benefactors – for the support of their daily life needs. 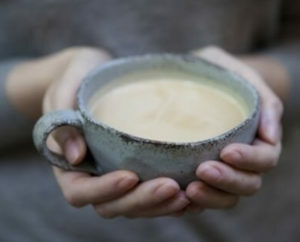 DANA, an ancient Pali word meaning generosity, giving, or gift, is central to the 2,600-year-old tradition of Buddhism. 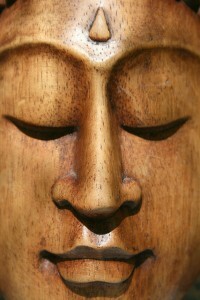 The teachings of the Buddha have been offered freely since the time of the Buddha. There was and is no way to put a price on the teachings of the truth – they are valuable beyond any fee one could set. At the end of the retreat, envelopes will be provided for you to offer Dana to the teachers. Giving to the teacher, from the heart, whatever feels appropriate, is the practice of Dana. You may also wish to offer Dana to the staff or to the Hermitage itself to support operating expenses or future scholarships. Another way to support the Hermitage is to donate all or part of the cost of a meal for the retreat. Your fees for this Vipassana Retreat will be used to pay for: rental of the Columbine Inn and attached expenses; other general retreat expenses; a retreat cook providing 2 meals a day; a small stipend and travel expenses for the retreat manager; a small donation to Sayadaw’s Meditation Center, as well as a small parsonage stipend for Marcia; and Sayadaw’s transportation costs. Please send a $1000 deposit with your application. The deposit will not be banked until your registration is confirmed and will be applied to the total fee for those accepted to attend. The deposit will be returned in full to those not accepted, or to those who are on a waiting list at the time that the retreat begins. The full deposit must accompany your application. Please refer to scholarship application/information form below for information on deposit amount that needs to accompany scholarship applications. No monies will be banked until you are accepted in the retreat. The balance of the retreat fee is due when you arrive for the retreat, or you can mail the balance to us in advance. If at all possible, we would appreciate you paying the full fee (deposit plus balance) at the time of application or upon acceptance, as this improves the efficiency of our cash flow. Please pay by check or money order in US funds, drawn on a US bank. We cannot accept foreign cash or bank drafts. We can accept international money orders in US dollars. We are sorry that we are not currently able to accept payment by credit card. Checks/money orders should be made payable to THE MOUNTAIN HERMITAGE. Cancellation fees apply to all confirmed registrations. Cancellations received on or before April 24, 2019: your deposit will be returned minus a $300 cancellation fee. Cancellations received on or before April 25, 2019, including non-attendance at the retreat: your deposit cannot be refunded. If you have already paid the balance, then that balance will be refunded minus the $1000 cancellation fee/deposit. CANCELLATION FEES WILL BE APPLIED TO THE MOUNTAIN HERMITAGE SCHOLARSHIP FUND (after the cost of the retreat is covered). In the event of specific, unusual emergency circumstances, the cancellation policy can be discussed with The Mountain Hermitage Office Manager after July 7, 2019, when the retreat is concluded. If you attend the retreat but for some reason decide on your own to leave early, the deposit and balance you have paid cannot be refunded to you. Anyone interested in attending this one-month retreat should read this document and the separate Practice Guidelines. Then, complete the Application form and Waiver of Liability, attach your deposit, and mail to: The Mountain Hermitage, PO Box 807, Ranchos de Taos, NM 87557. Applications and deposits are requested by May 2, 2019. Late applications will be considered on a space available basis. Applications will be accepted only by mail, not by phone, fax, or e-mail, because they must be accompanied by the appropriate deposit. Incomplete registrations, including those without sufficient deposit, will be returned for completion. Each application will be carefully reviewed. In some cases, a personal or phone interview will be conducted with one of the teachers prior to determination of suitability for this type of practice. All applications are processed by date received. We will respond within four weeks from receipt of your application. If your application is not accepted for this retreat, your deposit will be returned. Places are limited to 20 practitioners, so early application is advised. 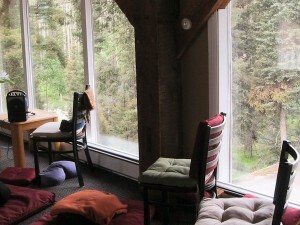 Once the retreat is full, you will be notified and placed on a wait list, and we will contact you if a place opens up. If it does not, then your deposit will be returned. If you are placed on the wait list and you then cancel your registration before a space has become available, your deposit will be returned. If you are placed on a wait list and are unable to attend the retreat, please let us know immediately. As long as your name remains on a list, we assume you wish to attend. If a space becomes available, we will automatically confirm your registration. Once you are confirmed for a retreat, you are liable for applicable cancellation fees if you subsequently cancel.